The flag of Wales is unfortunately not setup for web viewing as an emoji yet, but someday the dragon will shine on this page above when that is corrected. 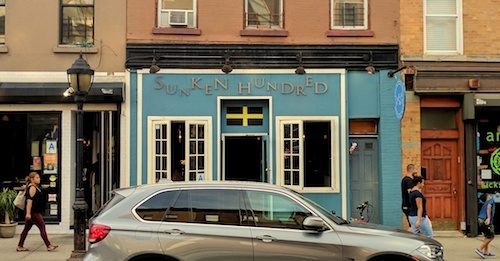 Sunken Hundred also chooses not to display the national flag, opting instead for the flag of Saint David that is visible over the door on the front. This yellow cross on black has recently been adopted as a symbol of Welsh nationalism and/or a dissatisfaction with the current flag. Wales is surrounded by the sea on three sides, a connection that feels immediate in the country but also here before opening the door. Once inside, photos are hung from the coast and underwater, while boating flags and the minimalist design all speak to this relationship as well. Opening the menu turns to the wide range of creatures and plants from the sea ready to be eaten. 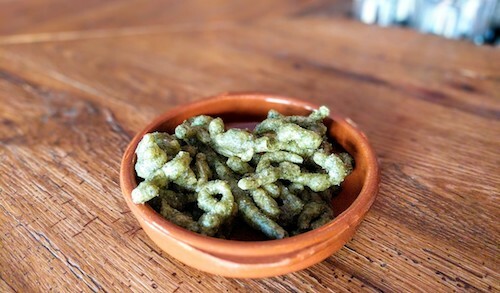 Order a beer at the bar, and a complimentary small bowl of salty seaweed fritters shows up. Seaweed is another ingredient that pervades throughout the menu, as does leeks, which we will see later. These set the tone immediately. Always coming here alone, the dishes sampled for this page all turned out to be appetizers and bar snacks, although this turned out not to be such a bad decision. 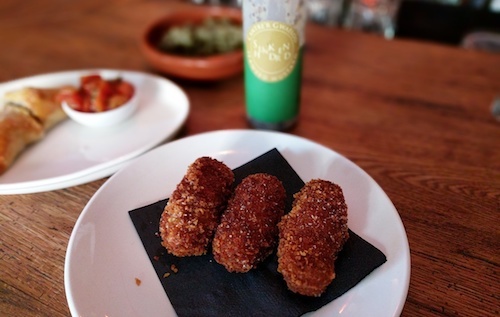 Welsh cheddar cheese and leek are the main ingredients of the Glamorgan croquettes ($9, below). Seeming to riff of the more famous Glamorgan sausage, a vegetarian variety with similar ingredients, these croquettes come with a well-fried exterior that takes a bit of work to break through. It is strongly recommended (from the bar) that you top your croquettes with their house made seaweed mustard, seen behind. While very tasty, some bites without are also good, letting your tastebuds focus in on the Welsh national vegetable: leeks. 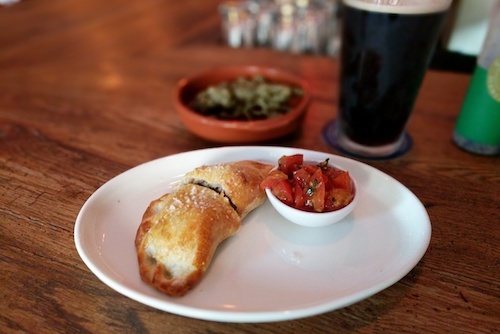 The lamb pasty ($9, below) is made with an exquisite short crust, so buttery and flaky. The meat inside almost seems like an afterthought with such a nice container, although the tomato chutney does help to add some herbal and sweet tones. 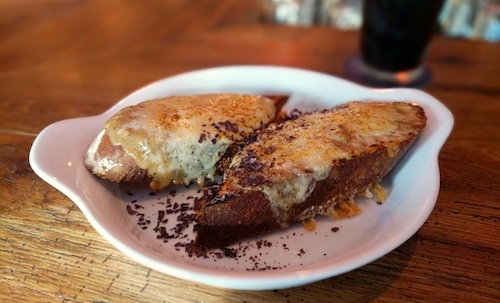 Without exposure to the nuances of Welsh cuisine, most North Americans are at least familiar with Welsh rarebit ($10, below), a simple dish of toast with melted cheese. The Welsh love to roast their cheeses, and the version of the popular dish here is just as tasty as it looks and sounds. Welsh beer is available on draft, as well as a few others like the Belhaven Scottish Black that was enjoyed during these visits. For Smith Street, Sunken Hundred is miles away from any pretension or unnecessary posh. The people here are friendly without prompting and had warm smiles on each visit. The bar seating, especially near the window, is one of the most comfortable places in the area to have a beer and grab a bite.